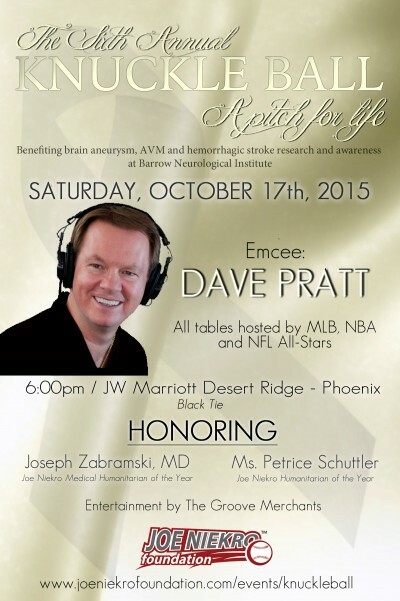 On October 17th, 2015, athletes from all over the country came together, in association with The Joe Niekro Foundation and The Society of NeuroInterventional Foundation, to support brain aneurysm, AVM and hemorrhagic stroke research and awareness at the 6th Annual Knuckle Ball…A Pitch for Life at the JW Marriott Resort in Phoenix, AZ. The Morning Mayor, Dave Pratt was the evening’s emcee while actress and brain aneurysm survivor, Tamala Jones spoke as our Special Guest Host. Petrice “TC” Schuttler was honored as the Joe Niekro Humanitarian of the Year for her outstanding commitment and contributions to the Phoenix community. Joe Niekro Medical Humanitarian of the Year recipient, Joseph Zabramski, MD was recognized for his research and continued advancements and treatment studies of brain aneurysms, AVMs and hemorrhage strokes. The Joe Niekro Foundation is committed to supporting patients and families, research, treatment and awareness of brain aneurysms, AVM’s and hemorrhagic strokes. We provide education on the risk factors, causes and treatments of these conditions, while funding the advancement of neurological research. Thank you to all who joined us for this unforgettable black-tie evening which featured a festive reception, silent auction, formal dinner, event program, LIVE auction, and musical entertainment (plus a few surprises) as we paid tribute to those that have lost their life to these fatal conditions, while honoring the survivors who are fighting everyday to recover. Click here to view this year’s photo gallery! A very special thank you to Teonna’s Floral Design Studio and Production for donating all event coordination for this year’s event. Your support and dedication to helping make this year’s event a huge success was unsurpassable and we look forward to working with you for many years to come.